This is a Recipe for preparing at home Masala Cauliflower chi Bhaji. 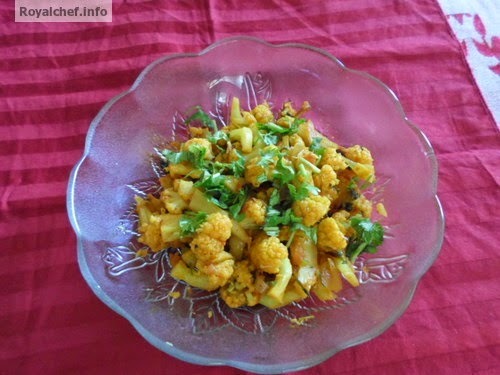 A spicy Dry or Suki Cauliflower Vegetable dish prepared in the traditional and authentic Maharashtrian Style of Cooking. Wash the Cauliflower florets and then boil them in the water for 5 minutes on a slow flame. 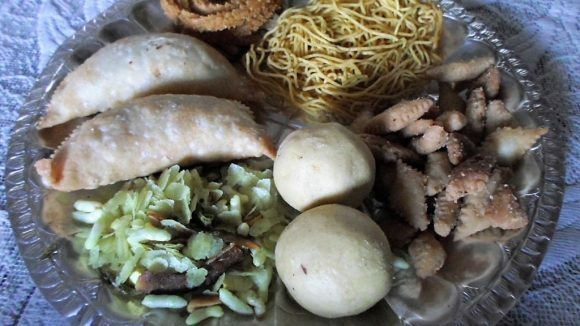 Heat the Oil in a Kadhai and prepare a Tadka. Then add the Onion, Tomato, Ginger-Garlic paste and fry for 2-3 minutes on a slow flame. Then add the Turmeric, Red Chili powder and Salt. Mix it well and then cover with a Stain less steel plate and add some Water over the plate and cook for 10-12 minutes on a slow flame. Then add Garam Masala, Coriander-Cumin Seeds powder and Coriander leaves. Mix it well and then cook for 2-3 minutes.